Recently in the recreational leaf market, CBD (also called cannabidiol) is making rounds as the newest alternative medicine with the best therapeutic effects for the user. If you knew better, CBD has around for many years now, in fact, it was what first found in Central Asia when essentially cannabis was discovered there. With that in mind, we can say that CBD is at least as old as marijuana, and it’s only now that media or the general public are coming to know of it. At the same time, when it’s awareness is disseminating in society, some opportunists are going to take advantage of CBD’s newfound popularity. They want to bank on CBD’s popularity by selling products (or CBD oil infused ones) with it that are not 100% CBD pure and are also mixed with harmful additives to make these products survive longer. Little did you know that there is a way around this kind of problem. What is that solution? Well, it is entirely possible that you can make your own CBD (and oil), and this way one can come around the problem of additive infested CBD ( and oil). But to know how one can make it, one should also understand what is CBD? And, this is what the next section tries to answer. CBD is a chemical compound that is derived from many different species of the cannabis plant that is highly concentrated on it. Unlike THC (also called Tetrahydrocannabinol) – another chemical compound that is derived from different species of a cannabis plant, CBD is not psychotropic. This means that CBD cannot make you high, while THC can easily do it. While these two have similar therapeutic effects for the user, but only THC can make you high. An example of high THC infused species of cannabis plant is marijuana. An example of species of the cannabis plant that is low on THC, and high on CBD is the industrial hemp. This is why a lot of times, CBD is extracted from the hemp family of the cannabis plant. Now that we are done with answering What is CBD? In the next section, we are going to discuss how do you make CBD oil? Want more information on What is CBD? Read our complete article on it here! So, how exactly is CBD made? Before we go onto describing the processes of making CBD, we shall inform you that the easiest way to make CBD is producing CBD oil. Other methods may be difficult to enact or do require an industrial/agricultural level of knowledge to create CBD. Down below are the ways CBD oil can be made. You may, or you can use your own formed CBD oil to make more CBD derived products, afterward. Though, right now the focus will be on how do you make CBD oil? There are three ways, through which CBD oil can be made. These are called Carrier Oil Extraction, Super/Sub Critical CO2Extraction, and Solvent Extraction. Each of these has different difficulty levels, and each of these will need different types of tools for the extraction of CBD. Your focus should clearly be on each step of the instructions that are provided for each of the methods. This is a popular way of extracting CBD oil. Usually plant oils like hemp oil or olive oil is the perfect candidate oil for the extraction of CBD. This method is essentially one of the safest methods of producing CBD oil, as the risk of explosions and accidents is minimal. Another benefit of this extraction method is that it can include some of the best nutrients, that can be derived from a carrier oil such as the olive oil. What one does is, put in the carrier oil and the plant resin from bud, all mixed up into a large piece of crockery that may be helpful with heating both of the materials. The heating is done up to a certain level (usually 200oF). This should be done after the buds of the CBD carrier plant have been decarboxylated in the baking oven for 20 to 30 minutes at 260oF. When this step is done, then it is time to prepare it in the saucepan. This is where have to the mixture is stirred perfectly, so both the ingredients are nicely combined. When done with it, heat the saucepan, as mentioned before to a level of 200o F at the very least but not more than 300oF (this is where chemicals like CBD evaporate). Keep the heat going until water starts to boil. Pour it in some containers so it can cool it off to room temperature. Seal the container, and then let it rest for at least two hours, while an overnighter can be much better. When you take the mixture/container out of the fridge, you will see CBD oil hanging about the upper portion of the mixture, while down will be the remaining water. Drain water out of the container, and then what’s left of substance in the container is, essentially CBD oil. Hopefully, this provides one answer for the question, how do you make CBD oil? It may have one drawback though, which is that the oils used in it, can be perishable after a long time, meaning that the CBD oil through this can only be made for personal usage. 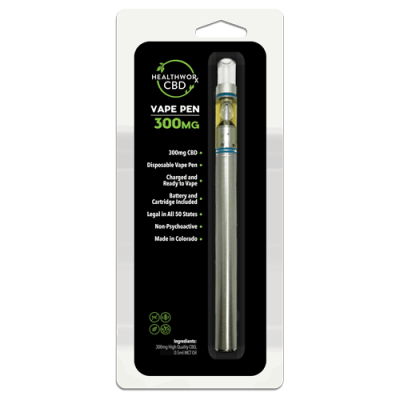 300mg Natural CBD Vape Pen for $34.99! Hopefully, this will be the best answer to the question – How to make CBD oil. This is where Carbon Dioxide is used through a piece of extracting equipment to extract CBD oil. The machine is called “The closed-loop extractor,” and is considered to be very expensive. While it can technically be used at home, but it can essentially also cost someone around thousands of dollars just for the equipment (excluding operating costs), and ten thousands of dollar for industrial grade setup. The equipment is expensive because, through this method and the equipment, one can have the purest form of CBD, without the additives. It is also safer and generally less toxic than the usual oil extraction method, and even the solvent method. This is because “the tuning” this extraction can provide helps put off harmful, and uninvited (even the ones that are not harmful) substances out of the result. This equipment has three chambers, and each one has a specific task to do. The first one is responsible for dry iced CO2, the second takes care of the hemp plant, and the third is responsible for the result. The first one pumps the CO2(dried ice) into the second chamber. This is where it is combined with the hemp plant to make a mixture, in a gaseous form (or liquid form if it goes subcritical). This is where it becomes supercritical or subcritical (depending upon your knowledge and essentially the temperatures, especially). In the third, the mixture (whether liquid or gas) is thrust from the second chamber. This where the cannabinoid(to which CBD also belongs) particles are absorbed. These are then spewed out in liquid form (always!) in a container that is temporarily attached to the third chamber, Voila! You get CBD oil here. Hopefully, this provides one answer for the question, how do you make CBD oil? 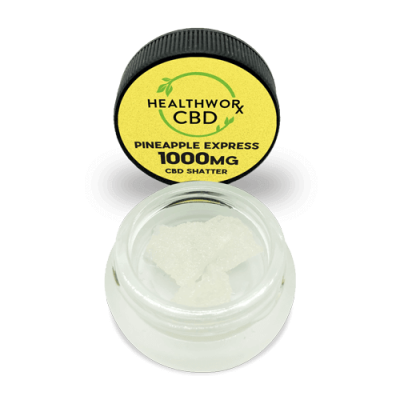 1000mg Pineapple Express CBD Shatter for $54.99! Known solvents like butane, alcohol, isopropyl, and ethanol can be used for extraction. This is not the safest method of extracting CBD oil from a cannabis plant, because a solvent can be highly flammable, so, therefore, can result in explosions. While it may be the least popular method for extracting, it is also the least expensive method of creating CBD oil. What one has to do is that mix the solvent with cut out buds of the cannabis plant that is high in CBD. Afterward, one has to leave them to combine completely. Check an hour later; then the solvent material has probably absorbed the cannabinoids (which also includes CBD). Then all that is left is CBD oil because now the CBD and solvent have become CBD oil after each other’s absorption. This type of extraction method is infamous for negating the positive effects of CBD, as it ruins the beneficial wax on a CBD infused plant, which contains many of the basic CBD compounds. Hopefully, this provides one answer for the question, how do you make CBD oil? But you shall at any cost refrain from this method at all times. Final words:This is the end of the line here, so is the end of our words. We hope, you know now how to make CBD oil(or CBD via its extraction). If you still want CBD products that are pure and do not wish to make CBD yourself, then by all matters try us. Still need a push of motivation? Check out our article on the Top Ten CBD Oil Benefits! This entry was posted in CBD Science and tagged HOW DO YOU MAKE CBD OIL, HOW TO MAKE CBD OIL, WHAT IS CBD.